SuperBot Entertainment announced today that the first downloadable content for PlayStation All-Stars Battle Royale will be released on February 12th, adding Gravity Rush‘s Kat and Starhawk‘s Emmett Graves to the game’s roster. 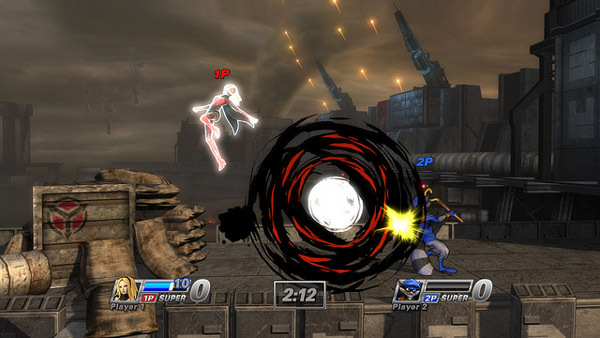 As a close range melee fighter, Kat’s main attacks in PlayStation All-Stars Battle Royale are based on her abilities in Gravity Rush. This means she will have several aerial kicked-based attacks and multiple gravity manipulation moves, that allow her to dash and slide around the stages. One of Kat’s more unique attributes is that she does not have a double jump in her move set but instead use of her Gravity Dash to enter a cancellable flight mode, in which she can move in eight directions through the air. Emmett Graves’ attacks all center around advanced technology weapons and Starhawk‘s “Build & Battle” system, which allows him to call down a Bunker to change his weapon loadout during matches. Naturally he will have access to his default rifle and pistol, however, additional weapons — like rocket launchers and shotguns — will allow him to adjust tactics mid-battle. SuperBot has promised that both Kat and Emmett Graves have received the same level of attention as the existing fighters. This means that both will have their move sets and bios added to the official website, in addition to each having alternate costumes, cutscenes, and trial modes. Aside from the two new fighters, PlayStation All-Stars Battle Royale‘s first DLC will add a new level called Fearless — which is a mash-up of the Heavenly Sword and the Wipeout IPs — in all ranked online matches (regardless of if you purchase the content). Buying the DLC will also allow you to access Fearless in offline and non-ranked lobbies. Finally, as promised, Kat and Emmett will be available as a free download for two weeks after their February 12th launch. After that the DLC will cost you, so make sure to jump on this as soon as it is added to the PlayStation Store. SuperBot has promised that more PlayStation All-Stars Battle Royale announcements will be headed our way in March. In the meantime, make sure to check out Kat and Emmett Graves’ new trailers down below.